Rock climbing has evolved with advancements in equipment and an ever increasing climber skill level. Those who were once considered senseless vagabonds are now exalted athletes. 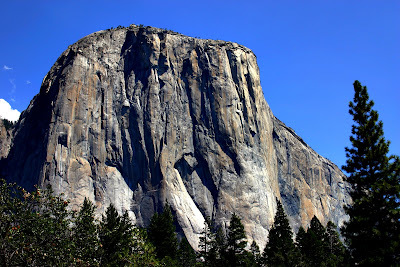 The 3,300-foot vertical wall of El Capitan took five weeks to climb in 1958 and now boasts a record time of 2 hours and 37 minutes, set in October 2008 by daring competitors Hirayama and Florine. The tools and techniques developed in Yosemite have since been applied to more remote mountain ranges throughout the globe. The Autry National Center invites the public to meet the people who pioneered modern rock climbing and those who are taking it in incredible new directions in its new exhibition Granite Frontiers: A Century of Yosemite Climbing. These determined free spirits and visionaries of one of the West's last truly wild experiences guide visitors to the edge of infinity to experience the exhilarating rush and harrowing perils of this most extreme of Western adventures. The exhibit runs from June 12 to October 3, 2009. "Climbers are among the last true Western adventurers," says Jonathan Spaulding, the Autry's Vice President for Exhibitions, "and Yosemite's big walls are one of the last wild places." After United States forces entered the valley in the mid-19th century, naturalists, photographers, and surveyors—including Yosemite's most famous visionary, John Muir—scrambled up the cliffs and peaks to document the scene. The Sierra Club brought Yosemite mountaineering into the 20th century by introducing new techniques in the early 1930s. Climbing pioneers such as Royal Robbins, Warren Harding, and Yvon Chouinard led the way for contemporary icons like Lynn Hill, Tommy Caldwell, Yuji Hirayama, and Hans Florine. "The Granite Frontiers exhibit is exciting," says Ken Yager, President and Executive Director of the Yosemite Climbing Association, "because it allows the public to view the 100-year history of Yosemite climbing for the first time. A visitor has the opportunity to see the evolution of Yosemite climbing, learn about some of the extraordinary exploits of these pioneers, and understand Yosemite's significant role in the development of the international climbing arena." To read more, Click here.